For the liberal tribe in America, the elections of this last week may have looked like the End of the World. We are taking our time to disavow them of this notion. Only the end of the world, is the end of the world. So starts the next month-long feature here on Radio Drama Revival – stories of, by, and for the apocalypse. Zombies, disease, feast, famine and gun-toting nuts from the woods, there are many ways to envision society’s end, and we’ll touch on a few these next weeks. Today! We have Aftermath, by Scotland-based artist Matthew McLean and co-producer Robert Cudmore’s troupe Yap Audio Productions. So what goes wrong in this one… ? Welcome to 2016. For the past five years the world has become an increasingly unstable place. The threat of war between China and the USA had loomed heavily over the rest of the world. Britain, now a small, insignificant and bankrupt nation, initially, as always, had sided with the USA. But relations quickly broke down beyond repair between the two nations, leaving the UK an isolated and unimportant outcast in world diplomacy. Faced with two gigantic, power hungry enemies on either side, things go from bad to worse in the UK when an attack on the country’s power and communications leaves its citizens without electricity, television, phone or internet. After nearly a fortnight, and with nothing more than speculation available about who carried out the attack and why, looting and riots spread throughout towns and cities like wildfire. Rumours of an emergency radio broadcast promising help, information, food and water in the centre of every city sees millions of people on the move as they try to head for safety, hoping that the crisis may be at an end. In reality, nothing can be further from the truth. In a car park, half way up Falkland Hill in Fife, a group of people who fled from the riot stricken towns below watch out over the river Forth in horror as Edinburgh is blitzed by a missile attack from the sky. The lucky ones are killed by the blasts, but anyone else close enough is subjected to the chemicals unleashed by the explosions. A devastating chemical attack turns ordinary people into bloodthirsty savages, and Scotland as we know it, changes forever. And now… this is the Aftermath. Dig in. 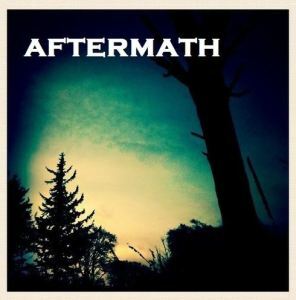 We feature Episodes 1-4, most of Season 1 of the Aftermath radio drama show. Production interviews? We got ’em. Matthew McLean’s Audio Drama Production and Matthew Boudreau’s Aural Fixation series.